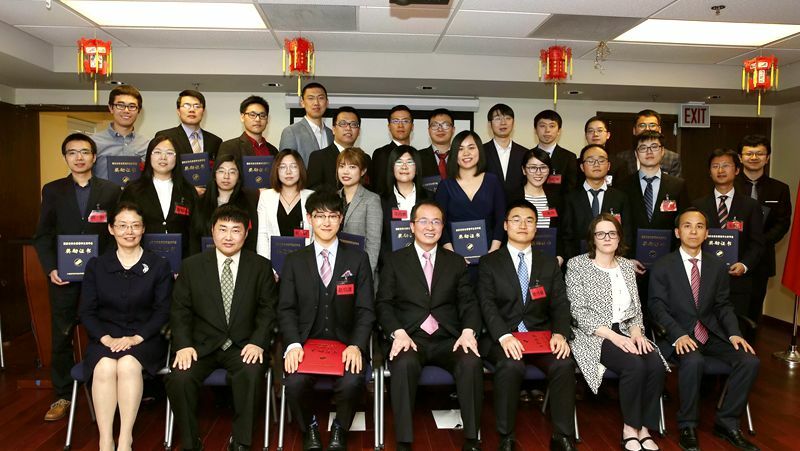 On April 27th, 2018, the awarding ceremony for the 2017 Chinese Government Award for Outstanding Self-Financed Students Abroad was held in the education office of the Chinese Consulate General in Chicago. Consul General Hong Lei attended the ceremony and presented certificates to the awardees. The ceremony was hosted by Counselor Chen Yinghui of the Education Office. Deputy Consul General Liu Jun, award-winning students and their relatives, representatives of academic supervisors, representative of the award committee, representatives of Chinese universities and research institutions, journalists and more than 100 guests in total attended the event. In his speech, Consul General Hong Lei congratulated the students on winning the highly competitive Chinese Government Award for Outstanding Self-Financed Students Abroad. He said that this award is the fruit of their diligent study and rigorous research and a recognition of their academic achievements. Consul General Hong Lei said that the 19th Congress of the Communist Party of China has outlined a blueprint for the great rejuvenation of the Chinese nation. In the past 200 years, the Chinese nation has suffered from great humiliation. Yet, through arduous and courageous struggle, we have once again stood at a new and glorious historical starting point. In this new era, China will follow the path of reform and opening up, develop its economy, and strengthen its comprehensive national power. China will also vigorously promote innovation, continuously improve people’s living standards, protect the environment, and realize sustainable development. Therefore, this new era demands talents and calls for talents like you. Consul General Hong Lei said that in his letter to the overseas Chinese students at the Lomonosov Moscow State University, President Xi Jinping urged Chinese student overseas to inherit the previous generations of Chinese overseas students’ glorious tradition of serving the nation, holding noble aspirations and studying diligently so as to become outstanding talents capable of shouldering the greatest responsibilities. President Xi hopes that Chinese students studying abroad will devote their knowledge and skills to the Chinese nation and Chinese people, and their youth to the great strive for their dreams. Consul General Hong Lei said that every generation of Chinese youth has responsibilities unique to their era. China has already achieved its historical mission of “standing up” and become materially better-off. Therefore, for this generation of young Chinese, it is their responsibility to strive for the historical mission that will make China strong by dedicating their energy to this great era and living up to the highest expectations of the Chinese nation and the Chinese people. Consul General Hong Lei hoped that wherever the students choose to work, they will continue to care about their motherland, contributing for China’s development in this new era. In his speech, Extraordinary Excellence Award winner Zhao Boxuan from the University of Chicago said that they have benefited from the motherland’s support throughout their study. Having received such great love and care from the motherland, we, as sons and daughters of the Chinese nation, should devote ourselves to the greater prosperity and strength of the motherland. Extraordinary Excellence Award winner Chen Weijian from the Washington University in St. Louis said that he deeply appreciates the support of the motherland for overseas students and the importance that China has placed on scientific research. The Chinese Government Award for Outstanding Self-Financed Students Abroad will inspire all self-financed Chinese students overseas to work hard and learn new knowledge and technologies to serve the motherland. 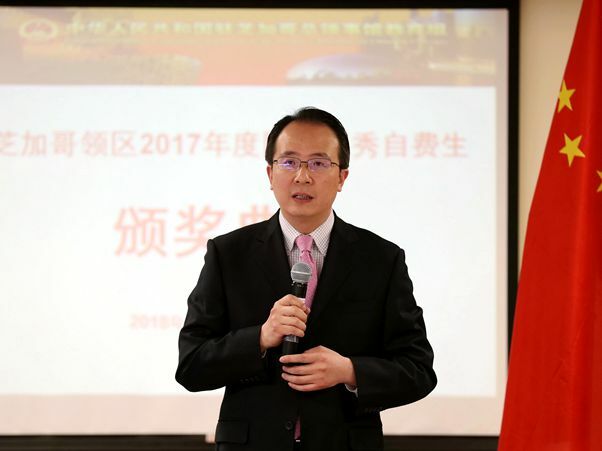 Professor Zhang Xinya, representing the award selection committee, said that since he served as a judge for this award, the research level of award recipients has been getting higher. He hopes everyone will continue to forge ahead and reach new heights. Professor Michelle Shumate of Northwestern University, a representative of the award-winning students’ academic supervisors, said that Chinese students are diligent and hardworking researchers, and she wishes great achievements to all. In addition to the awarding ceremony, the Consulate General also held an award winners’ symposium, an education seminar, and a job fair featuring Chinese educational and research institutions. The Consulate General aims to make full use of the event to build a platform for exchanges among award winners and to support the future career development of the award winners. The Chinese Government Award for Outstanding Self-Financed Students Abroad was established in 2003 and the Extraordinary Excellence Award was added in 2011. Currently, 500 students are awarded each year, including no more than 10 Extraordinary Excellence Award recipients. In 2017, a total of 500 Chinese students won the award, including 10 Extraordinary Excellence Award winners. Since the establishment of this award, 5,915 Chinese students studying abroad in 32 countries have won these awards, including 52 Extraordinary Excellence Award recipients. A total of 310 people from the Chicago consular district have won the award, including 15 Extraordinary Excellence Award winners.